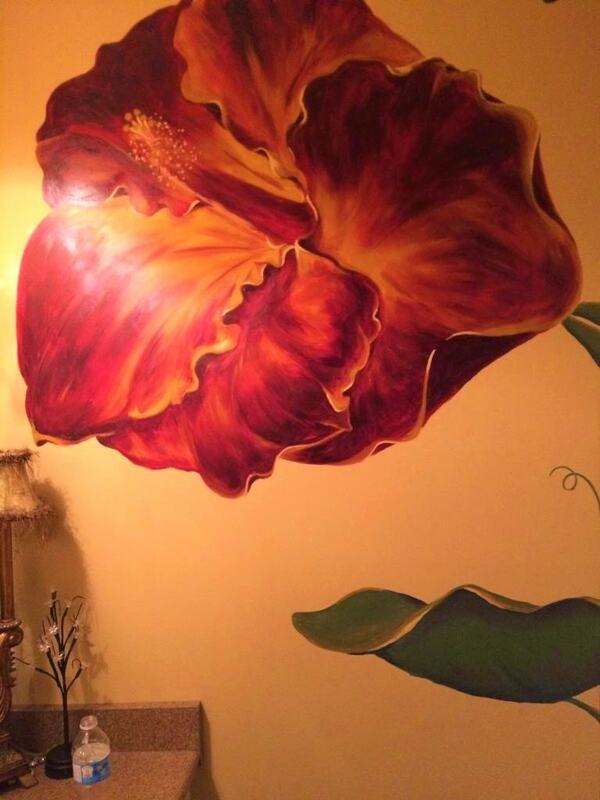 Even though this hibiscus mural was painted in Oakville, Ontario, I also sell flower wallpaper murals that ship for FREE in Canada and the USA. Scroll down to see some of my fave designs! They’re super easy to hang and totally removable when you’re ready to redecorate. Request a Quote for a Hand-Painted Mural! 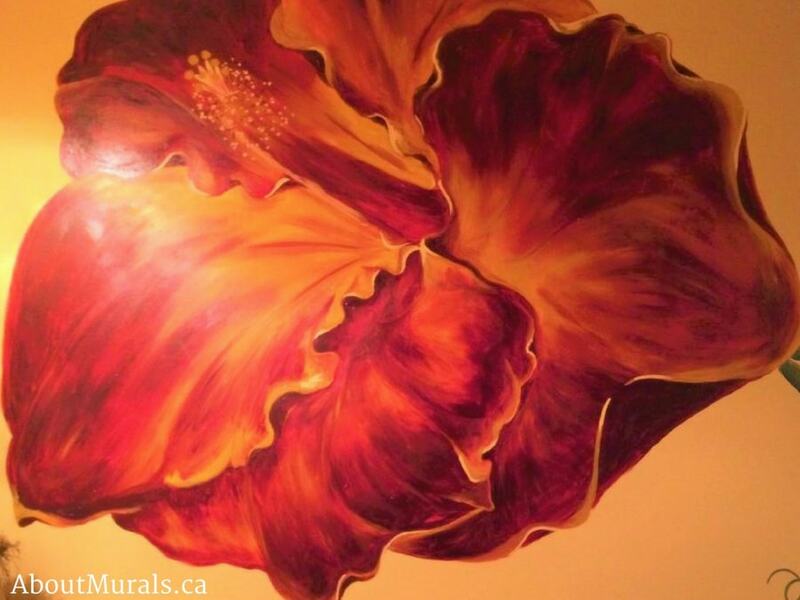 Thinking of a hibiscus mural for your own home? Here are some photos of a mural I painted to give you some ideas for your space. 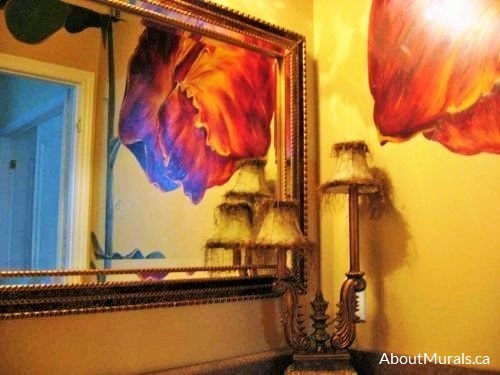 Marianne wanted a dramatic feature in her powder room and she loves flowers. After going through some gardening magazines, she decided to have a deep, rich, red hibiscus mural painted. I only use non-toxic acrylic paint and no-VOC latex paint when creating my murals, so it’s safe for you and your family to breathe the air – even on the day I finish painting. My wallpaper murals are all eco-friendly, too! The deep burgundy and gold hibiscus pulled all the gold accents of the powder room together. 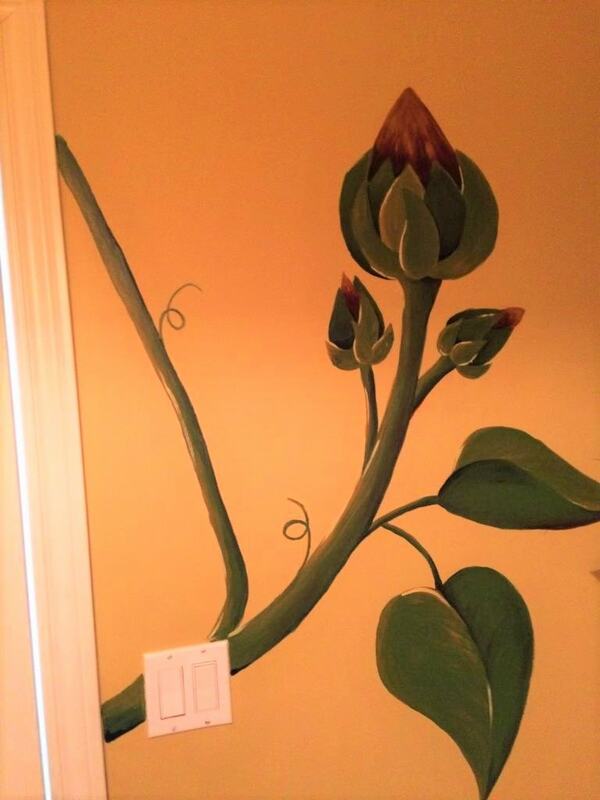 I painted green vines and flower buds coming from the hibiscus mural through the rest of the powder room. Still thinking of a flower mural for your space and like my style? Let’s work together! I’ve been painting murals, from Toronto to Niagara Falls, since 2005. I’ve even painted one for a Mike Holmes TV show! Or…Check Out My Flower Wallpaper Murals! Join my newsletter community and I’ll keep you posted on all the latest promotions and maybe even send you a hot coupon code or two!